Coloring is for everyone! Crayola® Folk Art Escapes offers coloring projects that will appeal to adults and kids alike. Coloring helps everyone relax and unleash their creativity. 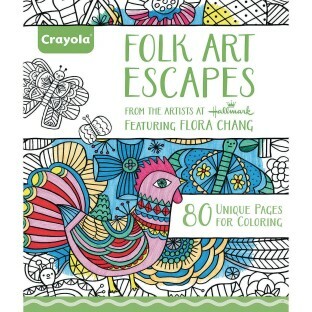 The book features 80 pages of fun and unique art from Hallmark artists. Designs are printed on high quality 80lb paper on one side only to prevent color bleed through. Each 8” x 10” sheet is perforated for easy tear out and suitable for framing. Color using colored pencils or fine line markers. Made in the USA.